NEW DELHI: India and the United States have sealed an agreement to jointly develop protective gear for soldiers against biological and chemical warfare, and another on building generators, defence officials said on Wednesday. The projects were cleared as US Defence Secretary Ash Carter held talks with Indian leaders to expand security ties between the countries that were on opposite sides of the Cold War but have since drawn closer against the rising weight of China. The United States has become one of the top sources of weapons for the Indian military, upstaging Russia in recent years, and now under Prime Minister Narendra Modi's "Make-in-India" programme offered joint development and production of military technologies. While the two projects approved are modest in scale, India and the United States are also exploring collaboration at the higher end of technology, Carter told reporters. "We have big ambitions, and jet engines, aircraft carrier technology are big projects that we're working very hard on," he said. Carter is due to sign a new 10-year defence cooperation pact with his Indian counterpart Manohar Parikkar later on Wednesday that will include cooperation in maritime security, another official said. The two countries conduct annual naval exercises in the Indian Ocean where China has made forays in recent years in a sign of its expanding reach. Both the project on protective clothing for soldiers as well developing the next generation power source for the battlefield will each have $1 million in funding shared equally by the two sides, a US defence official said. "We've negotiated texts, we've agreed to texts and they'll be signed into effect at the end of this month. We went from flash to bang, meaning from the joint statement in January to agreed to and signed texts in just under five months," the official said. The other two projects under the Defense Technology and Trade Initiative that Carter himself launched before his elevation as defense secretary relate to Raven mini-UAVs and surveillance modules for the C-130J military transport plane. 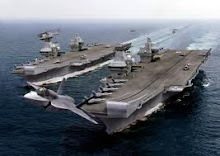 India is also eyeing US aircraft launch technology for a carrier it plans to build to replace an ageing British warship. The two sides have set up a working group to explore cooperation and the defence official said military officials will meet later this month in the United States. "We have the pre-eminent aircraft carriers in the world. They are excited about possible collaboration. There are multiple areas of possible collaboration. It's a huge platform," the US official said.